Tungaloys DoFeed has transformed the manufacturers way of thinking about milling. These ?exible and versatile tools offer much more advantages than any other milling tool: dramatically reduced cycle time and cost, long tool life, and high quality of ?nished parts. Also, the tools are easy on machines and applicable for various materials. No wonder DoFeed is one of the most popular milling tools in Tungaloys full product line. In todays hypercompetitive machining market, cycle time plays a major role in productivity and often determines the pro?tability of a given job. Simply increasing the speed or revolutions per minute (RPM) may appear to decrease the cycle time. However, reduction in cycle time would be converted to time to change inserts since the increased speed or RPM shortens tool life, which increases the tool cost at the same time. Because DoFeed cutters can machine multiple hole diameters and produce counter bore and countersink in the same operation, there is no need to change tools and purchase multiple tools. As a result, signi?cant time and cost saving will be achieved. DoFeed also provides high metal removal rate even with small depth of cut, which makes workpiece materials closer to the desired shape in one operation and minimizes or even eliminates the number of ?nishing processes. This characteristic is ideal for 3D machining. Most 3D machining begins with a block of material and the material is gradually removed until the desired con?guration is obtained. This method is subtractive manufacturing, which is opposite to additive manufacturing. An example of additive manufacturing is 3D printing. While a 3D printer places thin layers upon layers, DoFeed removes thin layers of material one by one. In both cases, thin layers help produce the shape close to the ?nal structure. Another advantage is that DoFeed is applicable for various materials. The series is an excellent choice for tool steel like molds, and even suitable for superalloys, such as titanium, Inconel, and others. Those materials are always dif?cult to machine since many of them need to be sheared. Whereas negative inserts tend to push the material and cause work hardening, DoFeeds inserts with very positive cutting edges, especially the ML geometry, easily shear the material and no work hardening occurs. For example, titanium is commonly used for aerospace parts due to its resiliency; a titanium part de?ects in response to stress and returns to the original shape. This characteristic works well for aerospace parts, but cutting titanium is problematic because of its tendency to push back. The strength of DoFeed is effective in this case since its positive inserts prevent the titaniums push-back and deliver smooth machining. 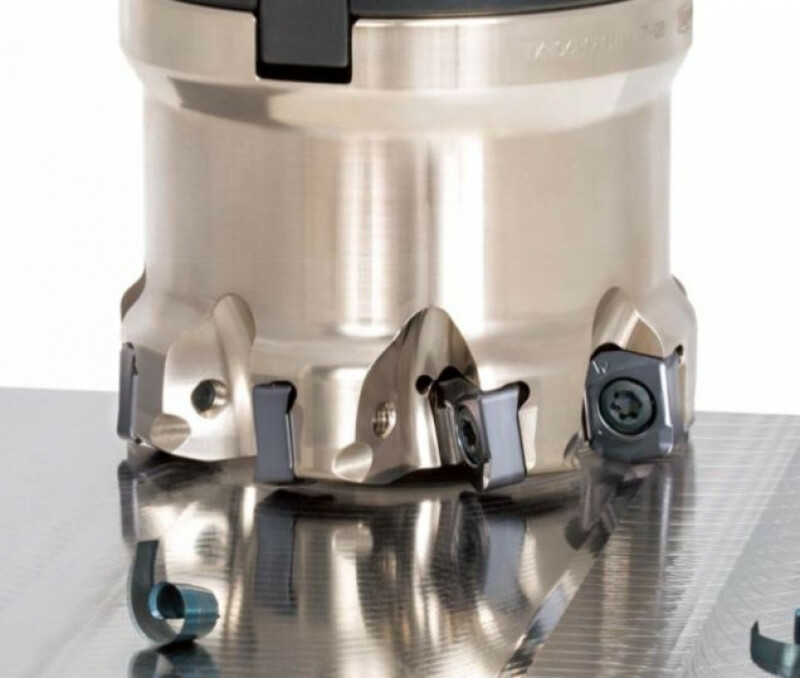 "DoFeed is an innovative tool series for high-feed milling even for Exotic Materials that helps customers save time for operations and cost on tools which were major issues of conventional milling. The series enjoys great reputations in the market as the advantages of the tools contribute to ef?cient machining and maximization of productivity in a wide variety of applications it is becoming the go to product for more and more applications." If you you're interested and would like to arrange a risk free trial please get in touch.